A VAN BY ANY OTHER NAME… THE 2017 CHRYSLER PACIFICA by Jim Corbran, Automotive Columnist To someone who bought a brand-new leftover 1995 Dodge Caravan for 14 grand back in the day, I was taken aback by the announcement of the new Chrysler Pacifica’s starting price of $28,595. Of course, once I took my head out of the sand (or wherever it was) and looked at what minivans (if this still is a minivan) are selling for these days, I was only in mild shock, rather than full-fledged call the paramedics mode. 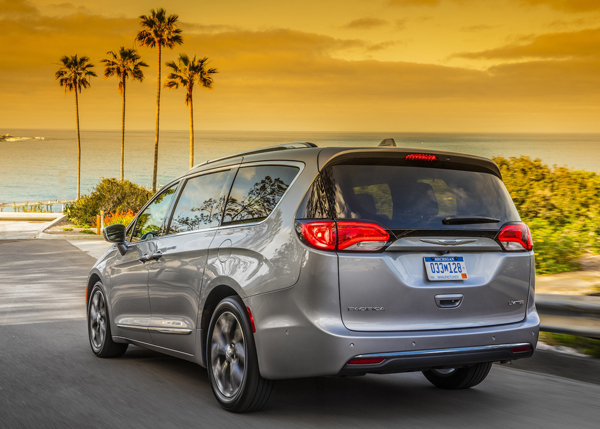 The new Pacifica is a great-looking vehicle… for a minivan. But I still can’t get past FiatChrysler (FC) dropping the Town & Country moniker to revive a name they last slapped onto a rather drab crossover back in the mid-2000s. I also find it hard to believe there won’t be a Dodge version. If we were to step into the Way Back Machine and set the dial to 1984, we’d see the Chrysler Corporation driving itself out from under layers of bad automobile choices — and they’d be behind the wheel of a Dodge Caravan/Plymouth Voyager, the vehicles that really began the minivan craze. The Town & Country (another name from the past) didn’t come along until later as a pricier version of the original two. The 2016 versions of the Town & Country and Grand Caravan will lumber on for a bit in Chrysler/Dodge dealerships. What? The 2016 T&C starts at $29,995. Who’s gonna want that, unless they’re steeply discounted (ya think?)? 2016 Dodge Grand Caravan SXT Plus Perhaps FC is having cold feet about dropping the Grand Caravan, as they’ve announced they’ll continue to build the 2016 version as a 2017 model for the foreseeable future. I guess this is what happens when automobile manufacturers with different lines attempt to build a version of every vehicle for each nameplate. Once they’re all in the same showroom it becomes a problem. Although I applaud FC for tooling-up a new minivan in this crossover-hungry, shun-the-soccer-mom-label market, I can’t say I agree with how they’re marketing them. If they really don’t want Chrysler and Dodge minivans, they should have marketed Dodge Caravan and swankier Grand Caravan versions of the new model in the fall, dropped the T&C (and ditched the Pacifica idea completely), while ending the run of the current 2016 version at the end of the model year. See the new Pacifica and (old) Grand Caravan by clicking on the names and decide for yourself. ### The post A VAN BY ANY OTHER NAME… THE 2017 CHRYSLER PACIFICA appeared first on Buffalo Cars.